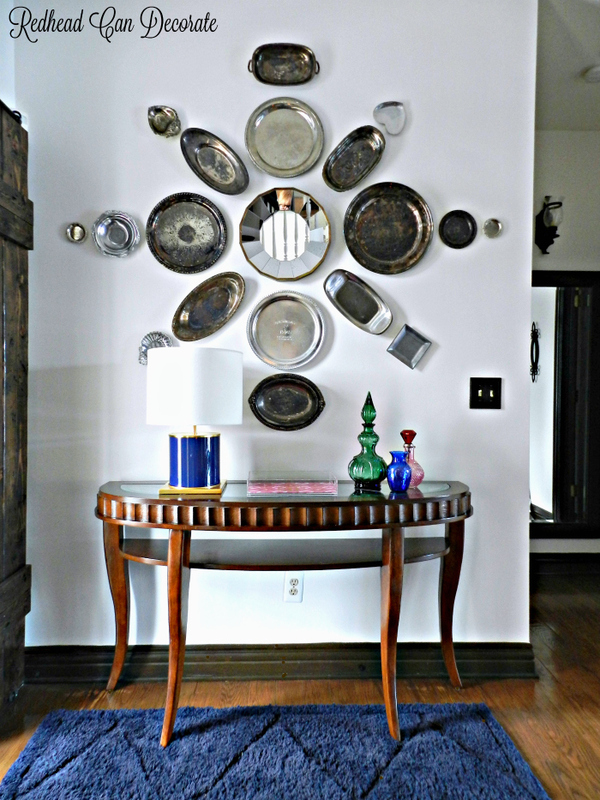 As you may know, about 3 years ago I created this very pretty “Thrift Store Silver Platter Wall” out of, you guessed it, thrift store silver platters. It grew to be one of my most popular blog posts, and even still today I do receive comments/questions on it. As much as I loved it, I still grew tired of it and just naturally desire change when it comes to home decor. So, when I finally decided to take it all down, I really had a big pile of silver platters on the floor that I had to figure out what to do with. 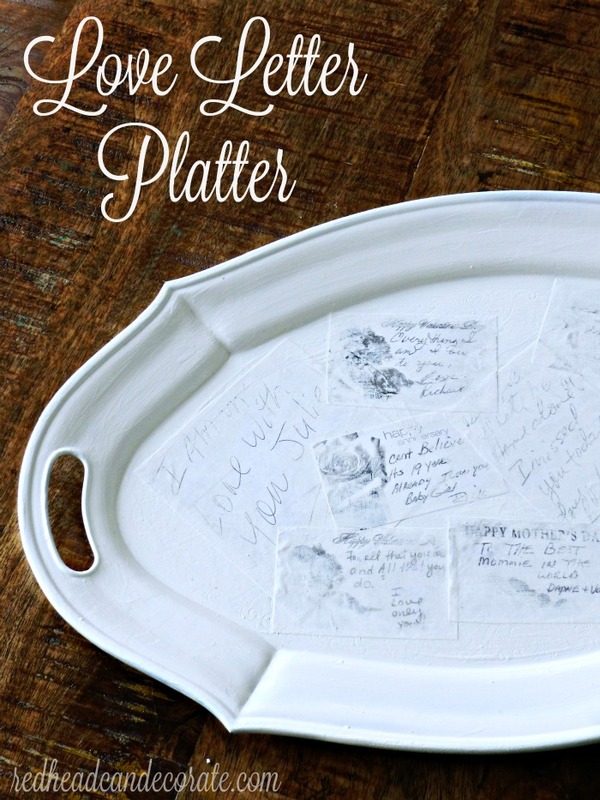 That brings me to this cute little DIY project today called “Silver Platter Chalkboard Sign”. Oh, and I thought I would throw in this similar idea using yet another silver platter. 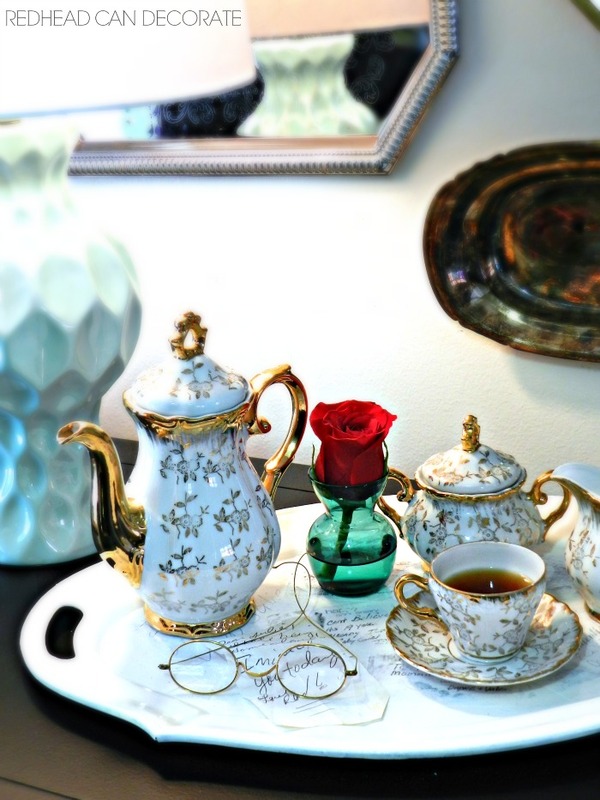 I treasure this pretty tray I created using the love notes my husband has given me over the last 30 years. Did I just say 30 years? Oh my! So, yah…back to those silver platters 😎 . What should I do with all the left over silver platters? Hmmm…I was originally going to just save them for my garage sale next Fall. 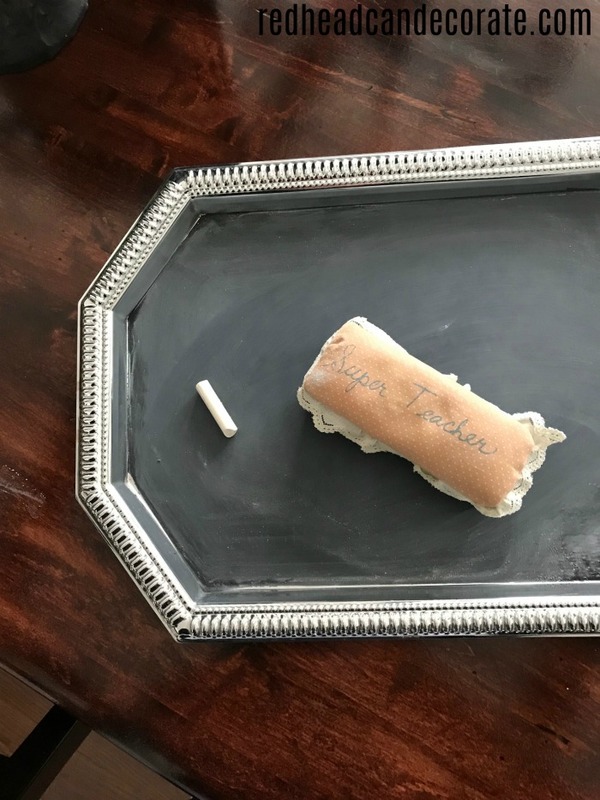 Then a sweet follower sent me a photo of her silver platter chalkboard sign, and I was inspired. She said she uses it often and it was really cute, so I figured I would give it a shot. So, the inspiring goes both ways around here. This silver platter chalkboard sign took me literally minutes to make and was so simple. I used blue painters tape to tape off the edges, and then I sprayed it with approximately 4 coats of chalkboard spray paint (both products found below in my source list). I was sure to let each layer dry at least an hour before I applied another. 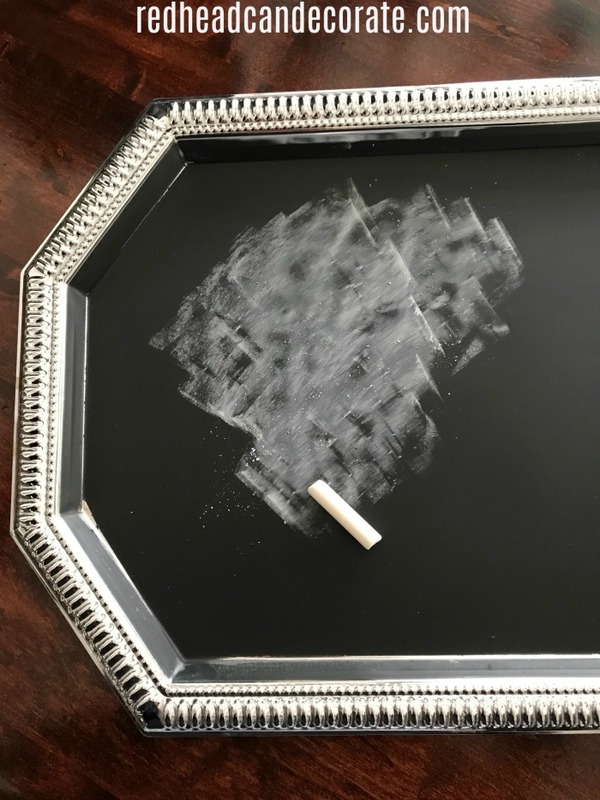 After I was sure it was dry, I “seasoned” the chalkboard by rubbing chalk sideways all over it and then using an eraser I have had since my teaching days to clean off the board, but leave it nice and “chalkboard-y”. And there she sits now in our kitchen above the cooktop on the shelf we made after our brick backsplash was completed. I got a little silly with my sign, but honestly it could be used for menus, holidays, birthdays, etc. Interested in giving this try? Or better yet, come to my garage sale this Fall and take all my extra silver platters. I’ll hand them out like business cards 😎 . I like it, Love to all Dad in NY. How did you attach the platter to the brick wall? Great question, I didn’t attach it. It’s just leaning up there. I am seeing a trip to the thrift store or store in my future because I LOVE these and need some silver platters in my kitchen to bounce around the light! I hope you find some!! Good luck, Cindy! My readers inspire me often! Thanks, Jan! What a great idea Julie!!! You amaze me with all your creativity:-) I’m going to definitely this a try. I am so happy to hear that, Ann! Let me know how it goes! Julie, love the tray, great idea. 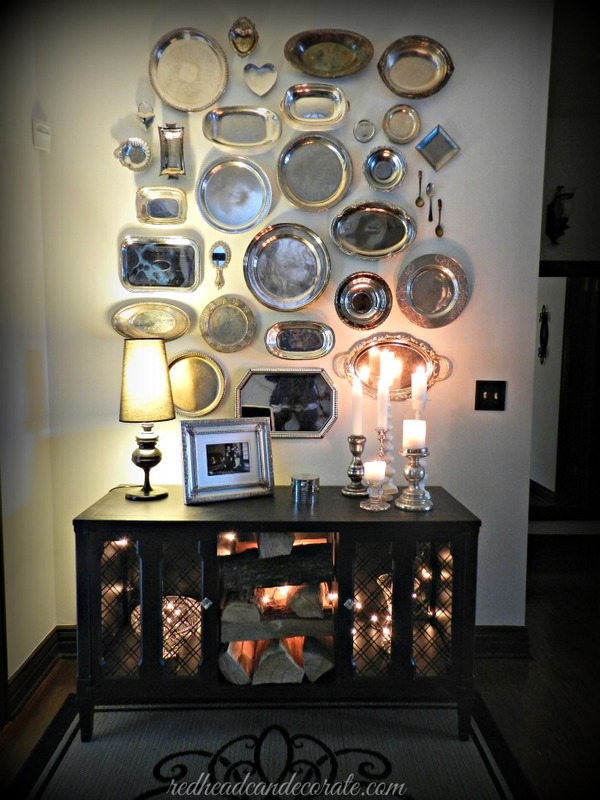 Also, I like what you did with the new platter wall. I like how it has a bit of whimsy and symmetry. Very cute! Thank you, Melva! It didn’t go over too well with most, so I’m happy to hear you enjoyed it. It just seems less busy to me. I adore the new arrangement of the platters and am trying not to have a fainting fit over the chalkboard paint on the silver – lol! You make a valid point, Janet! 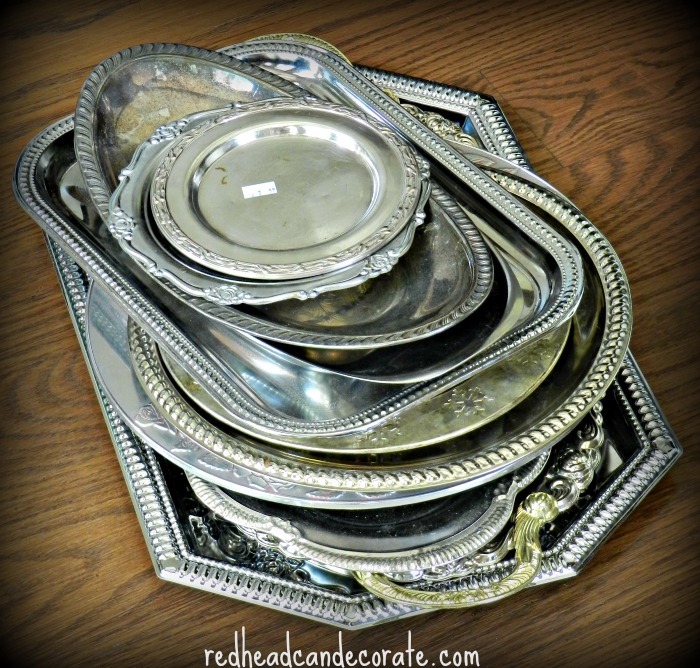 I can find these silver trays for really cheap at thrift stores. Most of them aren’t even real silver. I definitely wouldn’t do this to a family heirloom! I’m going to try this! I have a few trays from my wedding , 38 years ago, that are stored away. I’ll probably be struck by blogger lightning, but I’ve never been a fan of chalkboard stuff. However, this little silver platter is such a cute idea, I could use it myself. 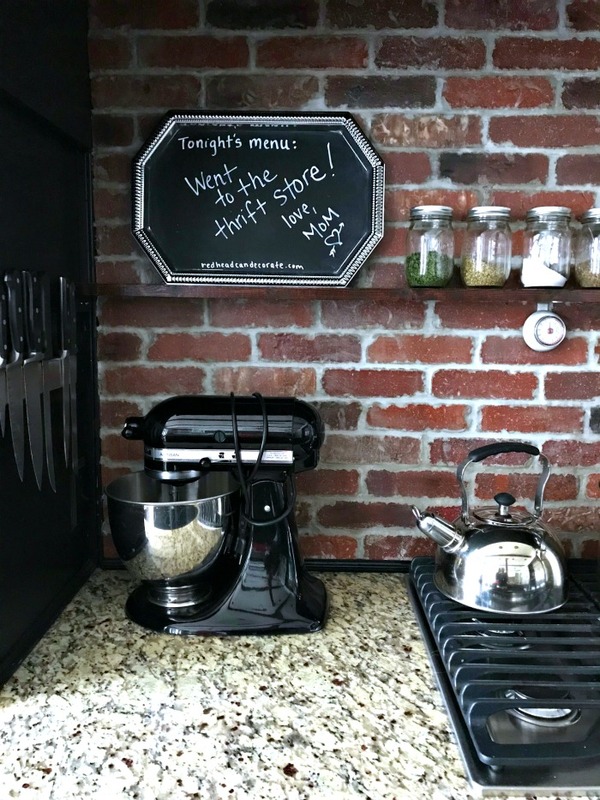 I doubt that it will make me a total convert to chalkboard, but this is a cute and useful idea. Blogger lightening! So funny!! Glad you like it, Pat! wow, outstanding, and creative. I cove this post Julie, and I also love the message you wrote, you are a girl after my heart. shopping of any kind. Hi Ivory! Thanks for stoppin over ? I love the ‘new chalkboard’; great use of your discarded silver tray. Wonderful idea for the kitchen; so many important things to jot down; better than post-its everywhere!! Looks so good on the brick. p.s. wondering what’s next for that wall???>>>?? ?……Julies’ wheels are turning I’m sure. As usual I wish I had your home AND the energy to do all you do. Your appetizer tree is still a big hit with the girls on Pokeno Nights! 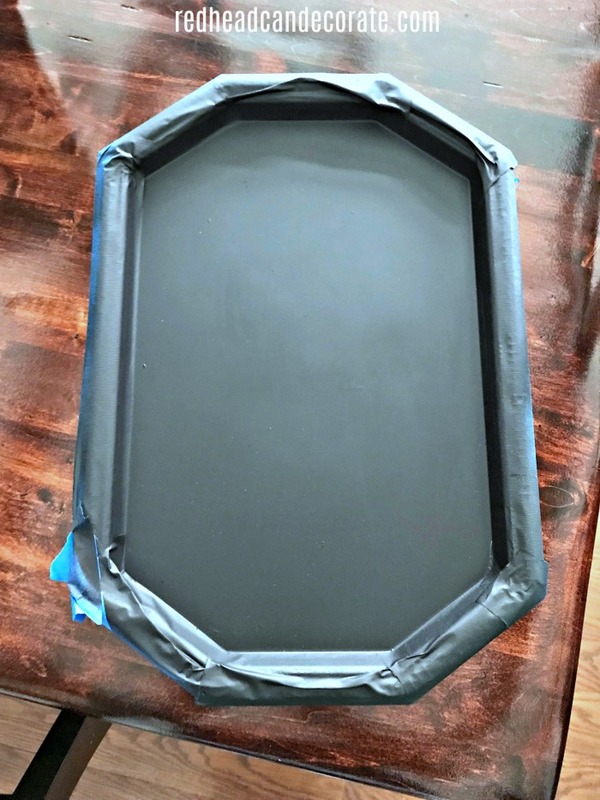 I’m going to try my hand making a dollar store silver serving tray into a message board. Wish me luck!! Good luck, Valerie!! It’s super easy! !